Regardless of what the weather brings you, the well dressed man needs something to Stop the Crowd. 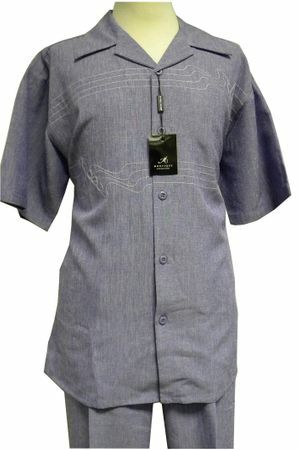 Montique has done it again with their new warm weather collection of short sleeve Mens Walking Suits. Only the Newest Style Fabrics are used for Montique Walking Suits. This Montique purple heather Short Sleeve Walking Suit is Just What You Need for Your Stylish Wardrobe. Featuring pleated pants and made of soft poly fabric with a washed feel.